As I have mentioned several times now that we have been making bread, and that continues unabated. For example, on Monday we are going to be making slow cooked butter chicken and we are going to be making the naan bread to eat with it. 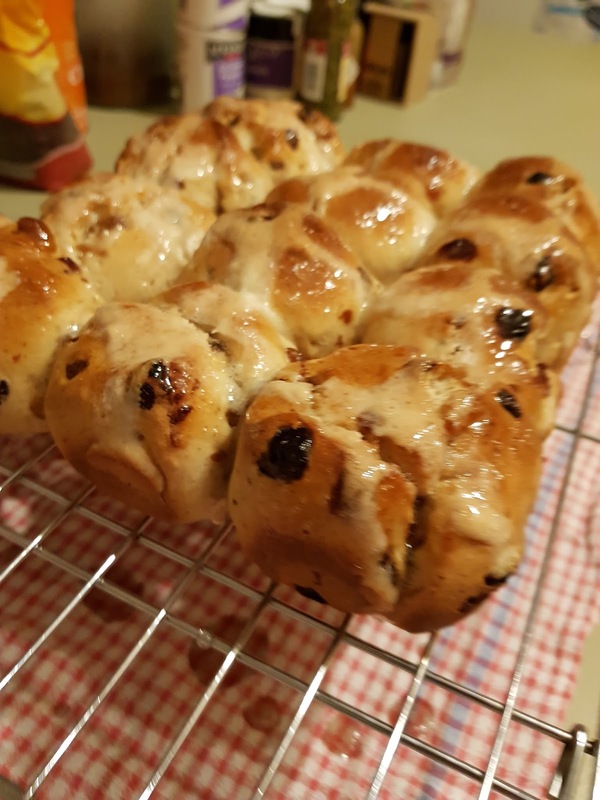 I decided this year that I wanted to try making my own hot cross buns, just because we can, so on Thursday night we bit the bullet and made first ever attempt. Whilst they weren't perfect, they were definitely tasty in the traditional way, and they were very nice toasted and then spread with butter. They weren't as light and fluffy as they could have been, but we think that we know why that is. I was a bit worried that I was going to end up with hot rock buns instead of hot cross buns. Yeast can be a tricky beast, and we didn't quite get it right this time, but we will! Maybe just not for another year or so. It's funny how divisive hot cross buns can be. There are those who hate that hot cross buns start to appear in the shops soon after Christmas, and those who look forward to them and have them regularly until Easter (that's the boyfriend). There are those who don't like sultanas in their buns, or the taste of mixed spice. There are those who like the newer flavours that include apple and cinnamon, chocolate and brioche style hot cross buns. For me, the only thing I prefer is that I like them toasted with butter. Other than that, I'm relatively happy to try anything. Combine yeast, sugar and milk in a small bowl. Stand in a warm place for 10 mins or until frothy. Knead the dough on a floured service for 5 mins. Divide into 12 portions. Roll each portion into a ball. Place in prepared pan. Cover. Set aside in a warm place for 10 mins. Preheat over to 220C. Combine extra flour and 2 tspn of extra sugar in a small bow. Stir in 2 tbspn cold water to form a thick, smooth paste. Place in a sealable plastic bag and cut off 1 corner. Pipe over buns to make crosses. 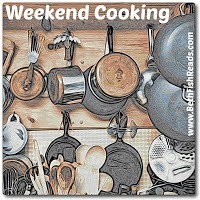 Bake for 20 mins or until buns sound hollow when tapped on top. Turn onto a wire rack to cool. How do you prefer your hot cross buns? Have you ever tried to make them? I made them a few times years ago but haven’t attempted since. I seem to recall the cross on the buns also went very wonky. I love the traditional ones, although I accidentally bought some brioche hot cross buns this year (obviously shopping without my glasses on so didn’t read the packet) and they are amazingly delicious. I might make them again one day. Good luck with your experiments, I love making bread. We made naan bread on Monday!! I’ve never tried to make them but I sure love eating them! I like hot cross buns however I can get them! Even though I bake a lot of bread, I've never made hot cross buns. I may make them for a late spring treat -- maybe Mother's Day?? ?